For a brief moment in the 1990s, GT1 was the top tier of international auto racing, with major manufacturers firehosing gigantic budgets into homologation special programs to conquer Le Mans. Also, there was this Lotus, sent with a handwritten approval to the FIA. 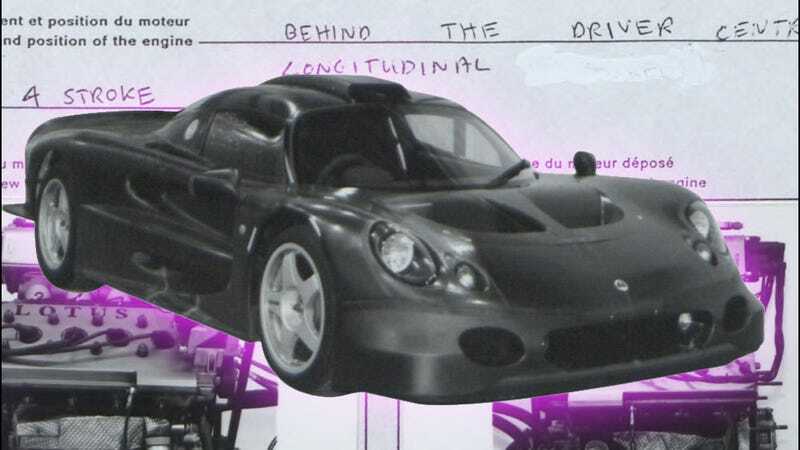 This is the Lotus GT1 (Turbo) as, its official FIA homologation document reads. We now think of the car as the “Elise GT1,” because that’s the name that would have made sense. It’s like a Lotus Elise built out for GT1 racing. But Lotus didn’t always make sense, so it’s the Lotus GT1 (Turbo). The (Turbo) nomenclature comes from this car’s lovely, if slightly brutish engine. The regular Elise was a real featherweight, and only needed a minute naturally-aspirated four-cylinder engine to screech across the UK’s country roads. The GT1 (Turbo) needed to run with the McLaren F1 down the Mulsanne Straight at Le Mans, so it got a twin-turbo version of the V8 in the Lotus Esprit, the Type 918. It was 3.5 liters, dual-overhead-cam, and made about 550 horsepower. That wasn’t quite enough power, so Lotus presumably scrounged around their furniture and dug up a Chevrolet LT5, a dual-overhead-cam V8 they designed for GM in the old Corvette ZR1. Lotus brought the LT5 up to 6.0 liters from 5.7 and ran it on a flat-plane crank, good for about 600 horsepower. That ended up being also not enough to compete with the big money, bigger power teams and Lotus pulled out of GT1 racing for 1998. By that time Porsche and Mercedes had made a mockery of the road-cars-turned-race-cars formula by designing their GT1 entries as race cars first, then homologating them for the road. Lotus never was really going to compete, anyway. Not that everyone was convinced. One privateer actually stuck a pair of V10s out of a GT2 Viper into two old chassis and called them the Bitter GT1, just to show how hectic this Lotus’ life was. In any case, please enjoy how homey the car’s FIA application is. While teams like Porsche and Mercedes issued color photos on perfectly typed together forms, Lotus filled its work out by hand. There’s even some white out. What a lovely little work.